Love photos and sharing them? 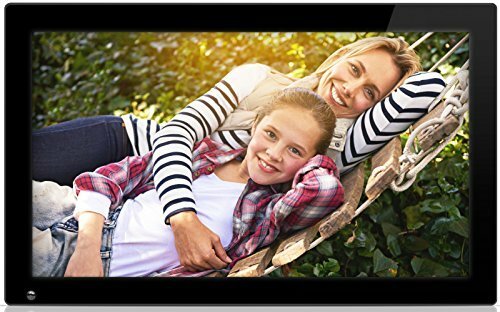 The Nixplay WiFi Cloud Photo Frame gives you control over your photos and power to share them where you want. Place the frame in your loved one's home and easily email photos for instant display from anywhere in the world, anytime. Create your FREE Nixplay Cloud Account that you can access from any computer or tablet. Access all your photos on Facebook, Instagram, Dropbox, Flickr & Picasa or upload them securely to Nixplay online cloud storage. It's simple and easy to use. Sync up to 5 frames and enjoy 10 GB of photo storage (Plus Account: 10 frames, 30 GB of storage, additional storage options). Create photo playlists and personalise photos with captions! Share your photos to multiple frames, for home, work, mom and your grandparents anywhere in the world. Create & update different photo playlists easily and choose which frame displays each playlist, or send multiple playlists to each frame! You have complete control. For ultimate convenience, the frame also comes with our 'Hu-Motion' Sensor that turns the frame on when you enter the room and off when you leave the room! Nixplay/NIX is the leading brand in digital photo frames globally. With 7 years experience, a dedicated customer service team and focus on the development of new services and features, we are committed to delivering high quality frames and services that allow you to share and display digital memories in a sophisticated way year after year. We give you a full 1 Year Part's & Labor Warranty at the time of purchase and are ready to assist you in any way. Create personal photo playlists: Access all your photos on Facebook, Instagram, Dropbox, Flickr & Picasa and upload them safe and securely to Nixplay online cloud storage. Manage multiple frames from one Nixplay Cloud Account: FREE Sync up to 5 frames and enjoy 10GB of photo storage (Plus Account: sync up to 10 frames, 30GB storage + storage options). Perfect for multiple frames for the whole family, anywhere in the world. LED Backlit display, premium Glossy Surface Finish, WiFi connectivity, VESA wall mountable. If you have any questions about this product by nixplay, contact us by completing and submitting the form below. If you are looking for a specif part number, please include it with your message.